Rocky topography helps shelter this small modern cabin on a fjord in southeast Norway. Others would have been tempted to open up the site by clearing the bushes and blasting away some of the rock. 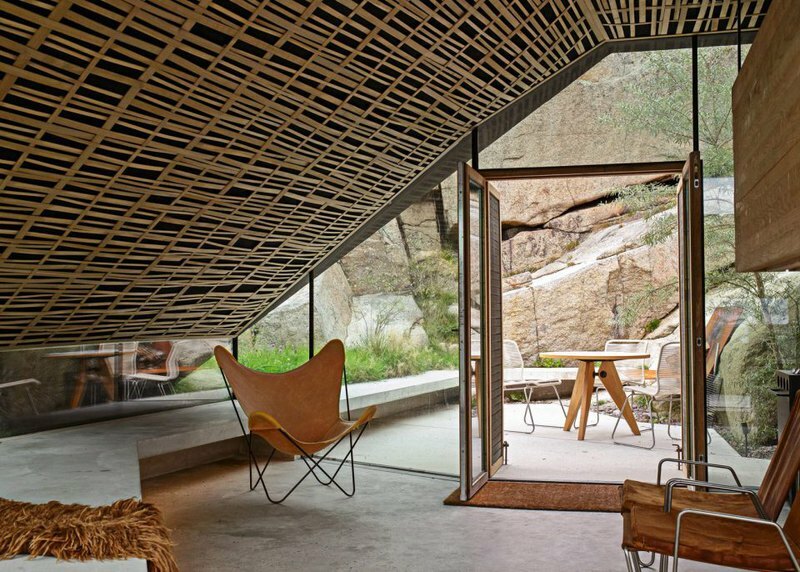 Instead, architects Lund Hagem designed the tiny cabin to fit between the boulders and wind-gnarled trees, tucking it against a rock bluff where it is half-hidden by a thicket of vegetation. Cabin Knapphullet (“buttonhole”) is constructed somewhat like a bridge, with one end of the reinforced concrete roof resting on the bluff and the other end angling down to meet the ground. As the walls don’t need to hold up the roof, they could be fully glazed. 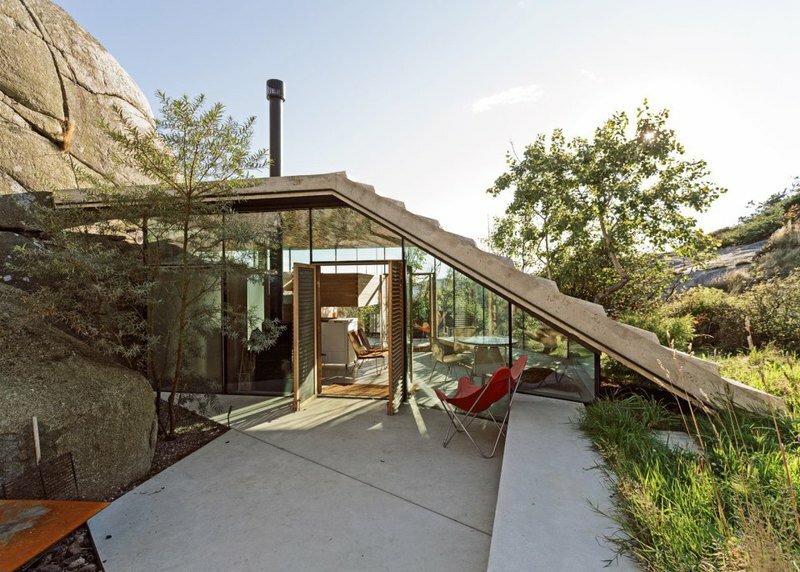 The approach path to the cabin squeezes through a narrow gap between the rock face and a glass wall. The cabin has approximately 30 m2 (323 ft2) of inside floor space with a combination living and dining room, a bathroom, and an oak sleeping loft suspended from the ceiling by steel rods. There isn’t a kitchen as the cabin was designed to provide additional accommodation at the vacation cottage shared by an extended family. However there is a wheeled cart stowed under the loft that looks like it is used for preparing light meals and snacks. There is also a partial basement which we guess is just used for utilities and storage, as the site was previously occupied by two small storage sheds. The sloped portion of the roof forms a wide ramp up to the roof deck, which serves as a viewing platform. 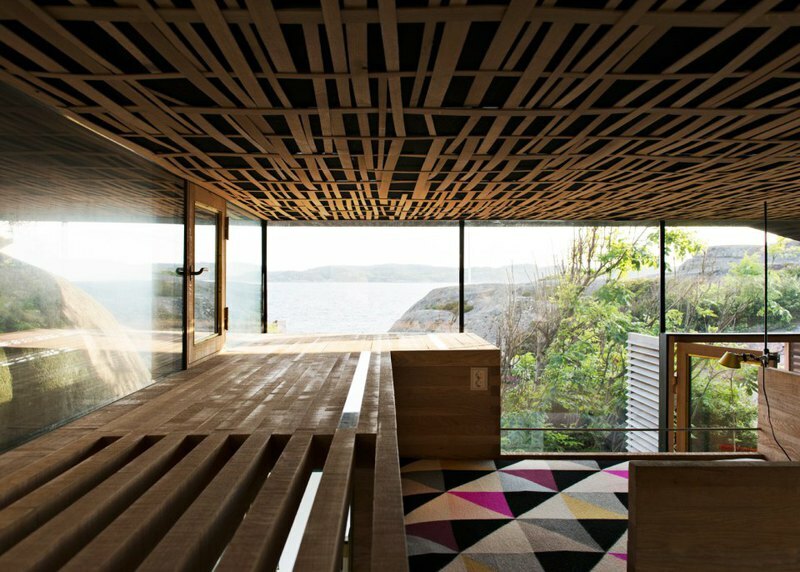 While the view from inside the cabin is framed by boulders and vegetation, the rooftop has a panoramic view of the fjord. When it is too windy to enjoy the view, a patio with fireplace behind the cabin provides an alternative outdoor space enclosed by the surrounding rock and the cabin itself.